Align, measure and develop your employees. ​individuals, growing dynamic teams or providing additional learning resources, we'll guide every step of the way. Align individual development with organizational goals. The 360˚ report provides a comprehensive understanding of an individuals strengths and developmental opportunities. This focused developmental guide is aligned around the competencies needed to achieve the organization’s strategy. Choose from three group level options: Executives, Mid-level Managers and Knowledge Workers. Each model uses the most commonly assessed behaviors so you can quickly set up your 360's. The 360 ͦ Survey dashboard provides a clear overview of the progress for each project. Just click on the project and follow the step-by-step process for setting up and managing each 360 ͦ project. 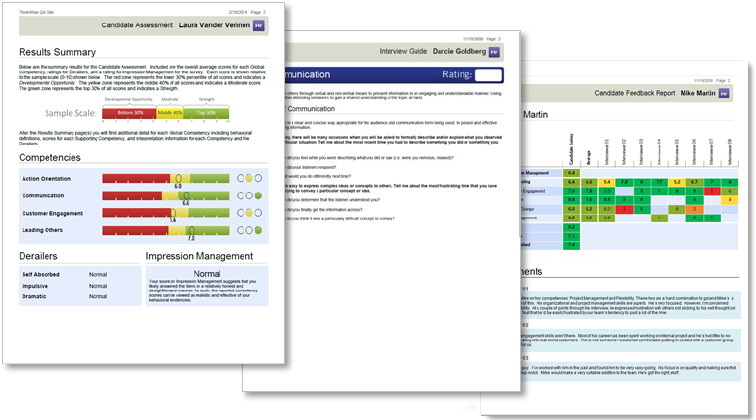 The Group-Rating option allows raters to submit assessments for multiple participants all at once. Clear and actionable reporting — your guide for employee development. The ThinkWise 360 ͦ Feedback Report is designed to provide a deeper understanding of how individuals are observed in the workplace and ultimately help them improve performance. ​The 360 ͦ report is easy to understand and shows participants how different people perceive them across various critical competencies (behaviors). The report will become their guide for continued growth. Without competencies, organizations can’t communicate the behaviors they need their people to exhibit to achieve the business strategy. It’s the link between their people and their vision. At ThinkWise, we put competencies at the core of our solution with our proprietary Competency Manager. The Competency Manager gives you the flexibility to match the exact skills necessary for your business objectives. ​Choose from our library of 22 global competencies and 62 supporting competencies. Use your own customized competencies. Upload from an Excel file for easy roster creation. Any duplicate information is identified to limit redundancies. ​Create custom invitations and save them as templates to use over again. ​Add as many raters as you like for each survey. ​Rate several participants in one pass rather than logging in separately for each one. ​Create your own role specific open-ended questions for even more valued feedback from raters. 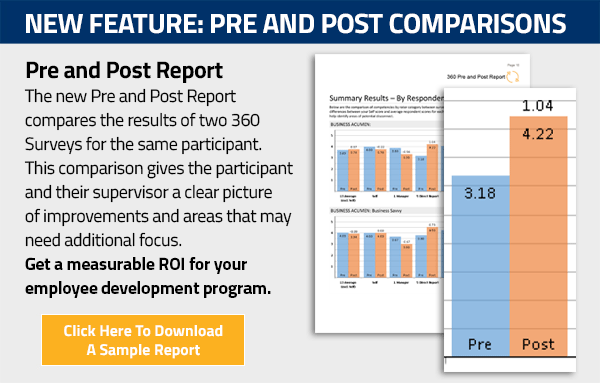 ​Compare multiple participants all in one easy to read report. ​Choose from our library of 22 global competencies and 62 supporting competencies to match your employee development goals. Save your projects as templates and use them for future projects. Customize surveys and reports with your company branding. Clear reporting that drives team growth. 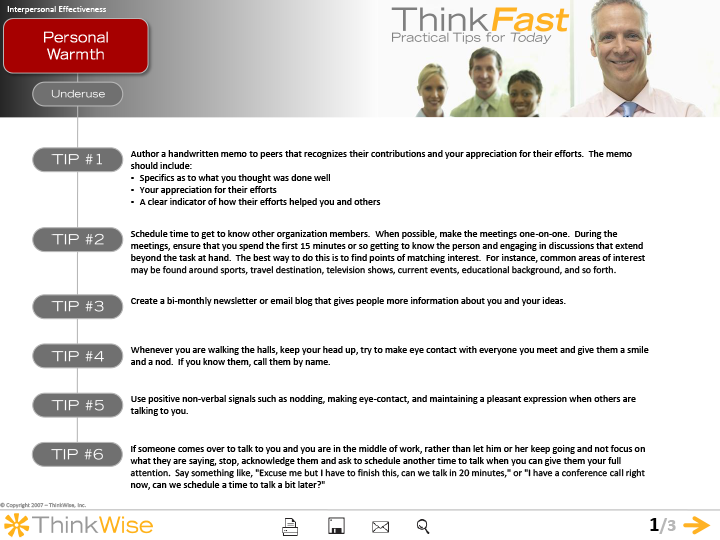 The ThinkWise Team Performance Survey is simple set up and deploy to your teams. ​Eight Dimensions of team performance. Process is the magnitude to which a team efficiently allocates resources and organizes the work among its members. Meetings prove to be an efficient use of time where members generate ideas and strategies for managing the work. Conflict is the ability for the team to handle debates and disagreements in an effective way. Teams with proper conflict management skills are more productive. Orientation is the degree to which members choose to be an active part of the team and are committed to team members and their collective goals. Team orientation involves a greater emphasis on team over individual accomplishments. Coordination is a synchronization of team actions in order to exchange work and complete team priorities in a smooth, efficient, and accurate manner. Effective coordination leads to efficient and seamless task performance. ​An easy to use, intuitive experience for you and those taking the survey. Your team members should complete the survey in under 20 minutes. ​Launching the team survey is as easy as emailing a link and there is no need for you to build out rosters. 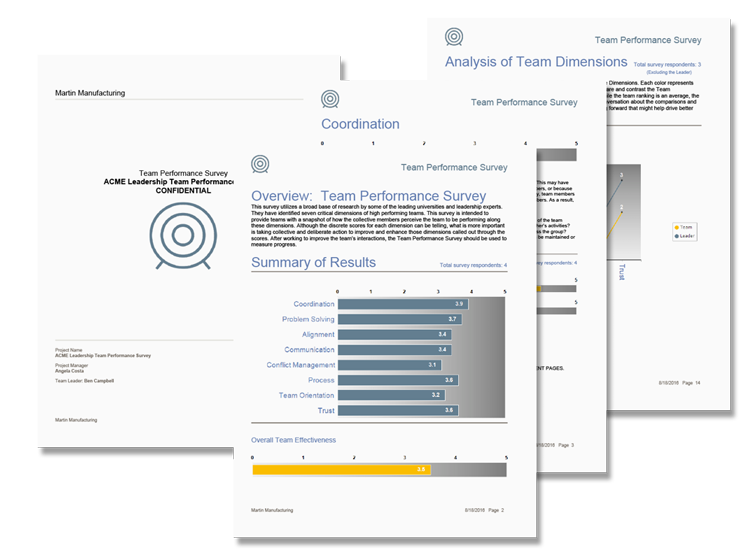 ​Our reports include how team members rank the 8 critical performance dimensions compared to team leaders. Targeted content for real growth. ThinkBox supports the multi-faceted process of behavior change. ThinkBox utilizes micro-learning and has everything you need to provide your employees with resources that are aligned with the 360˚ and team performance reports. ThinkBox learning bridges the gap between reports and rapid development. 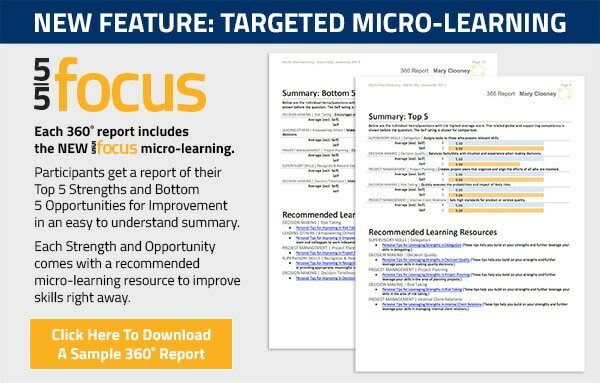 After the 360˚ Survey or Team Performance report, give your employees an edge to learn, develop, and improve. ThinkBox allows for flexible learning to be deployed so you never have anyone wondering what to do next. Learning when you want it, learning when you need it. ​ThinkBox utilizes the On-Demand Learning Model, or micro-learning. ThinkBox was created specifically to be bite-sized and to the point, providing the ability to access and go through content at the time of your choosing. Quick tips are focused on detailed learning in small, bite-sized pieces. Flexible. Hiring tools can be set to mirror your ThinkWise Competency Model, or you can choose a different set of competencies. Illuminating. Our candidate assessment combines personality and competency assessments into one easy to read report. Practical. Our Interview Guides come with competency and behavioral questions, follow-up probes, and ‘Listening Points’ – helping every manager become an expert interviewer. Intuitive. The workflow and email integration make using the tools and providing feedback easy work for candidates, interviewers, and the hiring manager. Link your people to your business strategy. The Competency Modeler makes it simple for you to build your own competency models – which then become the ‘blueprints’ for hiring, managing, and developing your people. Our interactive and collaborative tools allow you and your stakeholders to quickly facilitate the creation of competency models linked to your business strategy.